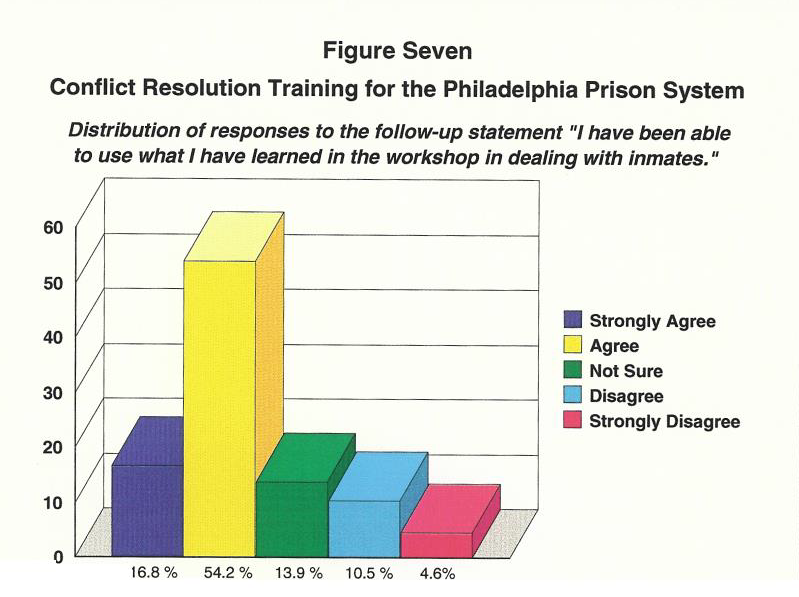 I was asked to provide Teambuilding Attitude Conflict Transformation [TACT] training to the staff of the Philadelphia Prison System. I requested as much diversity as possible, so staff from all five prisons, at all levels from CO to Wardens and from all departments were assigned to each training. After providing weekly trainings for two years, I was asked to provide follow-up trainings on anger and later on effective supervisor skills. After having trained over 70% of the staff, the training was incorporated by the training academy into the orientation of all new staff. It was placed in the second week of orientation, because the training academy felt it improved the entire training experience and better prepared the recruits for service. Deputy Commissioner Press Grooms commented that there was a positive culture change in the system, departments were working together better, there was a “softening of gaps” between disciplines and ranks and there was an improvement in communication skills. Also, over the period of TACT trainings, there was an overall reduction in use of force, however this could not be accounted for just by the TACT training as pepper spray had been introduced during this period. 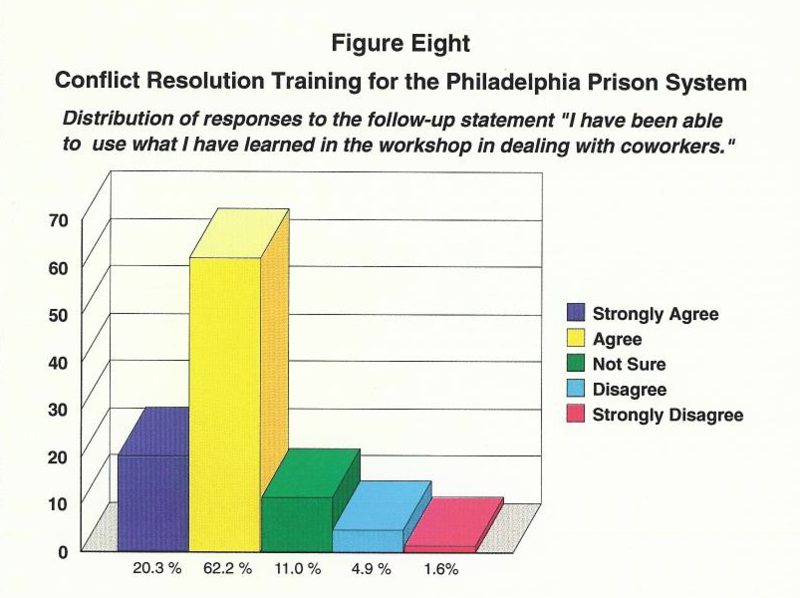 A feature article was published in Corrections Today [American Correctional Association] about the experience of the Philadelphia Prison System’s with TACT training. Each workshop participant was asked to fill out a workshop evaluation questionnaire and a work environment questionnaire. The results of the evaluation questionnaires show that nearly all participants rated the quality of the material and the quality of the presentation as excellent or good and most expected to use what they have learned in dealing with others. The results of the work environment questionnaire show that there is room for improvement in a number of areas. Although a statistically significant improvement was found in several areas during the first year, this trend did not continue during the second year. 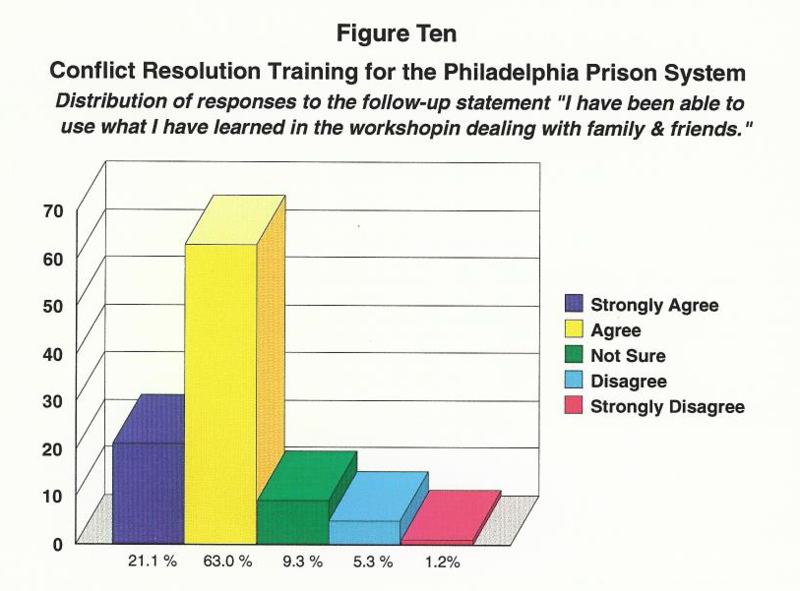 During the first year, a follow-up questionnaire was sent to workshop participants. These results were also positive, showing that the participants have been using the skills learned in the training in the workplace and at home. 1127 workshop evaluation questionnaires were received and analyzed. 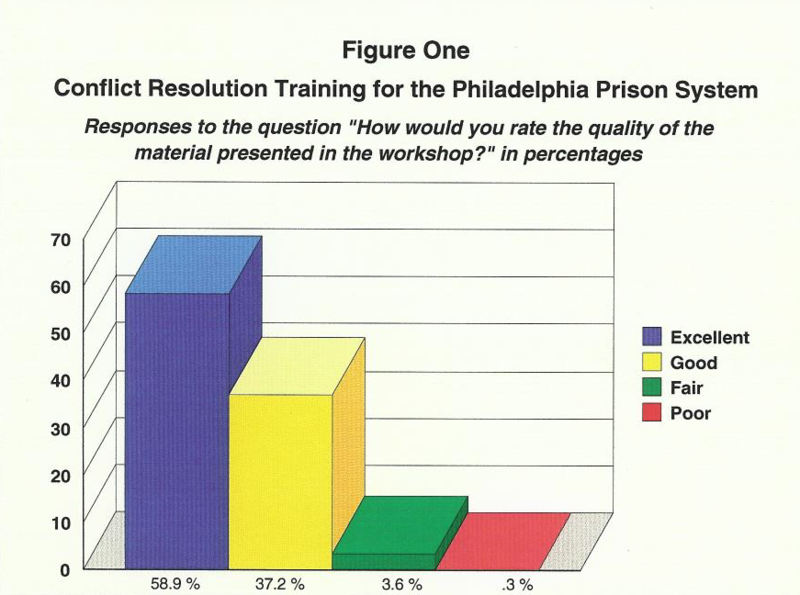 Figure One shows that most respondents rated the quality of the material presented in the workshop as excellent. 96.1 percent rated the workshop as excellent or good. 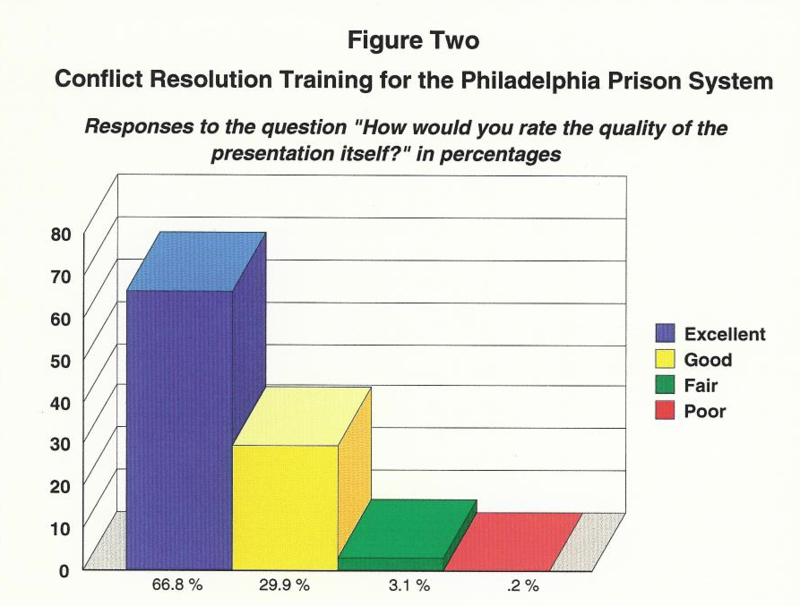 Figure Two shows that most respondents rated the quality of the presentation of the workshop as excellent. 96.7 percent rated the workshop as excellent or good. The next set of questions asks respondents whether they expect what they learned in the workshops to help them in both their work and personal lives. The results, which are presented in Figures Three through Six on the following two pages, clearly show that participants do expect the knowledge and skills gained in the workshops to be helpful at work and at home. Respondents indicated that they most strongly agreed that they expected to use what they have learned with family and friends. 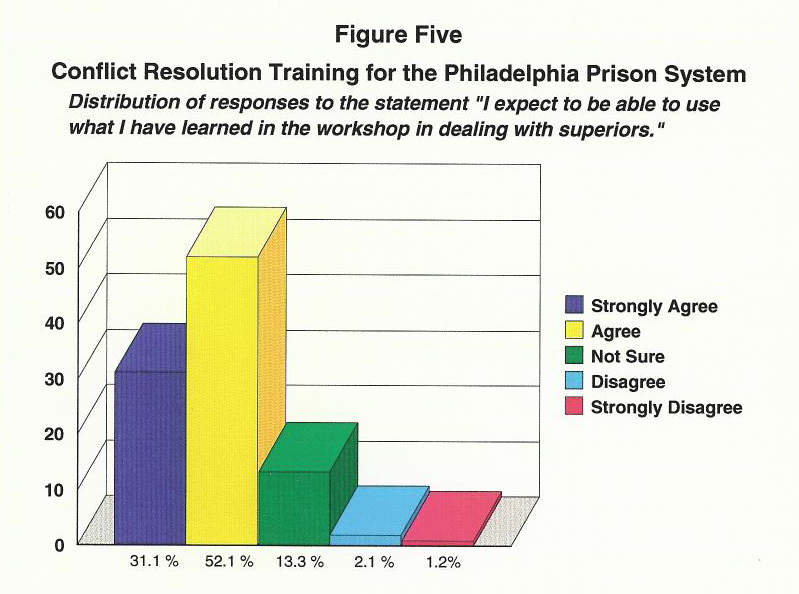 In summary, the respondents clearly valued the workshops and expected them to be useful in the future. There were a variety of suggestions for improvement. A significant number of people requested that administrators also attend or that all ranks be combined within a workshop. Some suggested a change in the timing of breaks. Others requested more corrections-related material. Most of the suggestions, however, were highly individual. In addition to the workshop evaluations and work environment questionnaires, workshop participants were surveyed several months later to assess whether they had been able to put in practice what they had learned in the workshop. 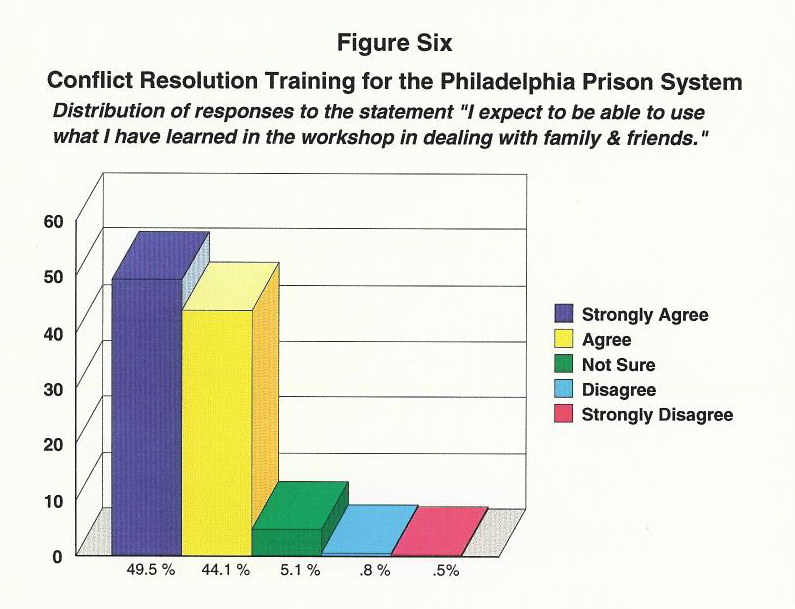 Respondents were asked if they had been able to use the knowledge and skills gained in the workshop in dealing with inmates, coworkers, superiors, and family and friends. 247 follow-up questionnaires were received. The results are favorable, showing that respondents have been able to use the knowledge and skills gained from the workshop at work and at home. More than eighty percent reported that they had been able use what they had learned from the workshop with family and friends as well as with coworkers. 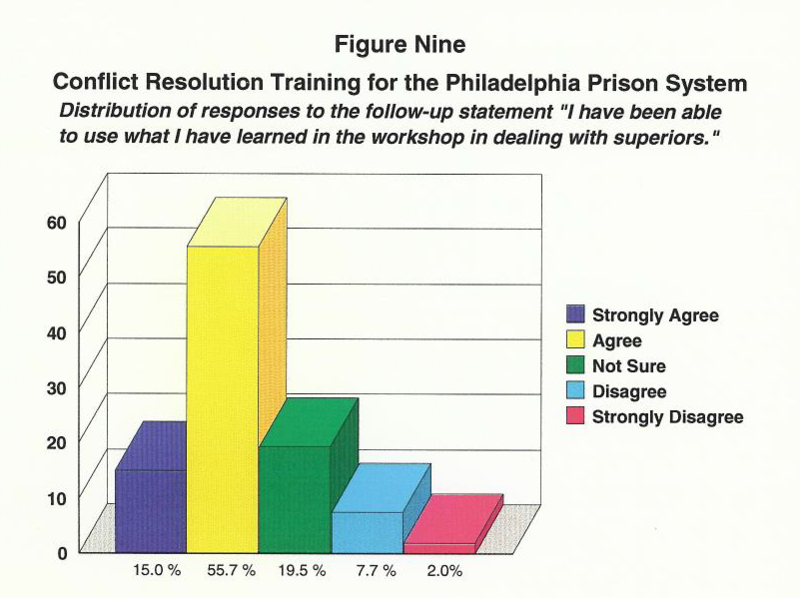 Close to seventy percent reported that they had been able to use what they had learned with inmates and superiors. Figures Seven through Ten show the results.